Styled after Darth Maul from Star Wars. Perfect if you are going full on Sith lord. If you're a Star Wars fan and you're thinking of what kind of Halloween costume would be the best for you then we have a suggestion - Darth Maul. 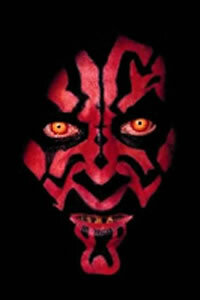 ColourVue Darth Maul contact lenses will make your change much easier - they provide an amazing effect, just like in the movie. Yellow and red contacts will make your eyes look creepy and scary making your costume complete. You can wear them all day as they are very comfortable. Enjoy your party!